4 The Elbow The elbow is considered to be a complex joint because of the humerus articulates with the radius and the ulna. Flexion and extension of the forearm are carried out in the sagittal plane, and the supination and pronation occur in the transverse plane. Because of lack of padding, the elbow is vulnerable. 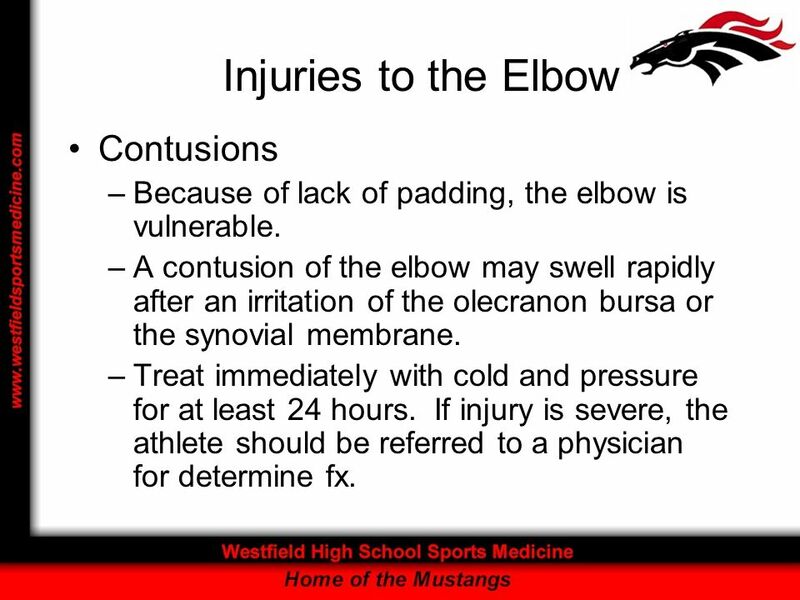 A contusion of the elbow may swell rapidly after an irritation of the olecranon bursa or the synovial membrane. Treat immediately with cold and pressure for at least 24 hours. 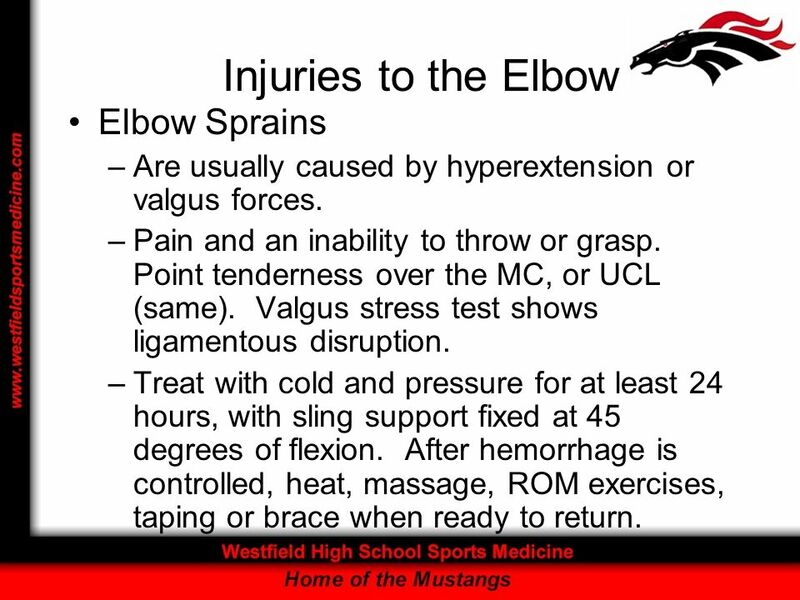 If injury is severe, the athlete should be referred to a physician for determine fx. 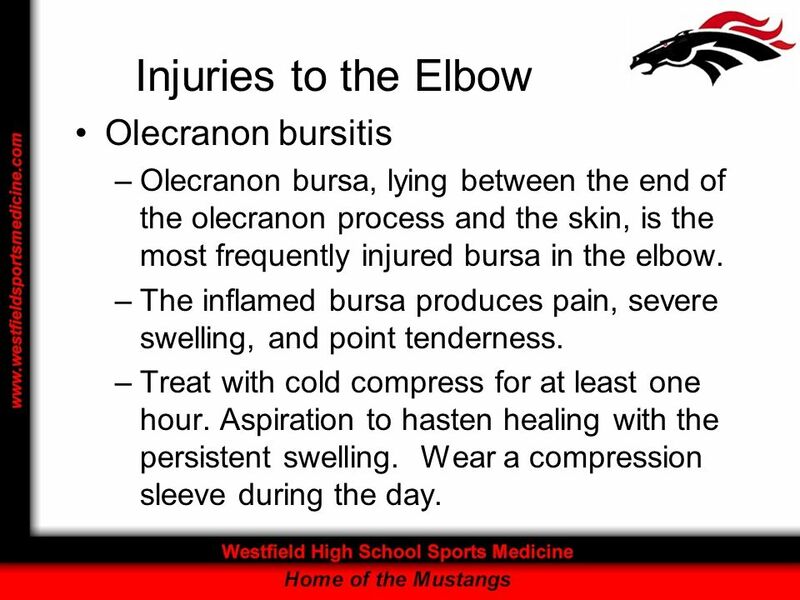 Olecranon bursa, lying between the end of the olecranon process and the skin, is the most frequently injured bursa in the elbow. The inflamed bursa produces pain, severe swelling, and point tenderness. Treat with cold compress for at least one hour. Aspiration to hasten healing with the persistent swelling. Wear a compression sleeve during the day. Can occur to the biceps, triceps and the brachiallis muscles. These muscle should be tested through active and resistive ROM. Signs include tenderness during active and resistive ROM, and point tenderness in the muscle, tendon or lower part of the muscle belly. Treat with RICE and slind support for the most sever cases. Followup with cryotherapy, ultrasound and rehab exercises. X-ray to rule out fx. Are usually caused by hyperextension or valgus forces. Pain and an inability to throw or grasp. Point tenderness over the MC, or UCL (same). Valgus stress test shows ligamentous disruption. Treat with cold and pressure for at least 24 hours, with sling support fixed at 45 degrees of flexion. After hemorrhage is controlled, heat, massage, ROM exercises, taping or brace when ready to return. 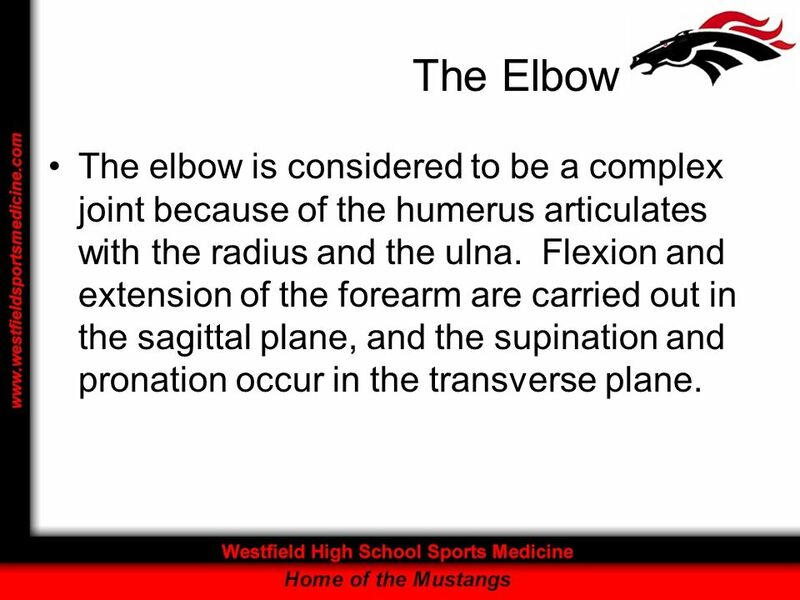 Chronic condition that may affect athletes who execute repeated forearm flexion and extension movements such as in tennis, pitching, golf Most often seen in tennis, backhand. Caused by repetitive microtraumas to the insertion of the extensor muscle of the lateral epicondyle. Pain that gradually becomes worse in the lateral epicondyle region during and after activity. Treatments includes immediate use of RICE, NSAIDs, and analgesics as needed. Treat with ROM exercises, PRE, deep friction massage, hand grasping in supination, and avoiding pronation movements. May wear neoprene sleeve for 1 to 3 months. Pitcher’s elbow. Similar to the lateral epicondylitis, but on the medial epicondyle Pain over the medial epicondyle of the humerus that can be produced during forceful wrist flexion or extension. Treat with rest, cryotherapy, or heat through the application of ultrasound. Antiinflammatory drugs may be prescribed. The curvilineat brace may be applied just below the bend of the elbow. 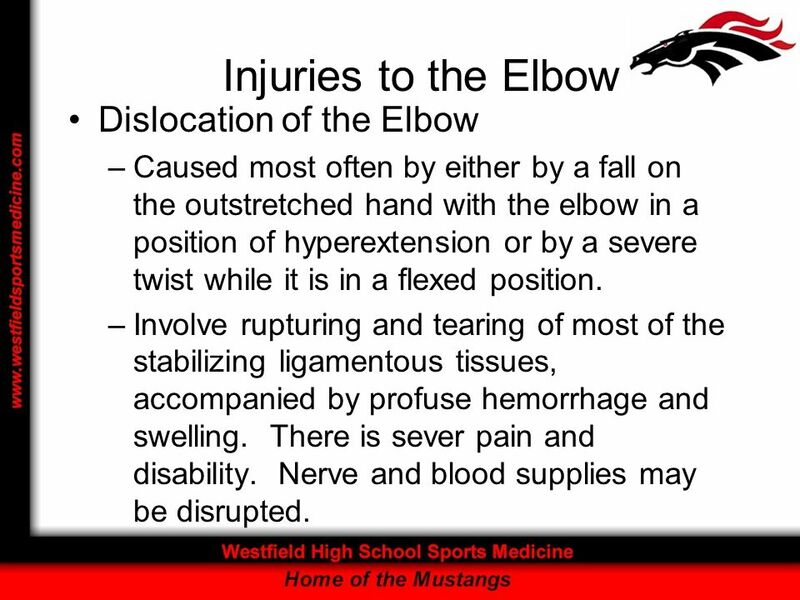 Caused most often by either by a fall on the outstretched hand with the elbow in a position of hyperextension or by a severe twist while it is in a flexed position. Involve rupturing and tearing of most of the stabilizing ligamentous tissues, accompanied by profuse hemorrhage and swelling. There is sever pain and disability. Nerve and blood supplies may be disrupted. 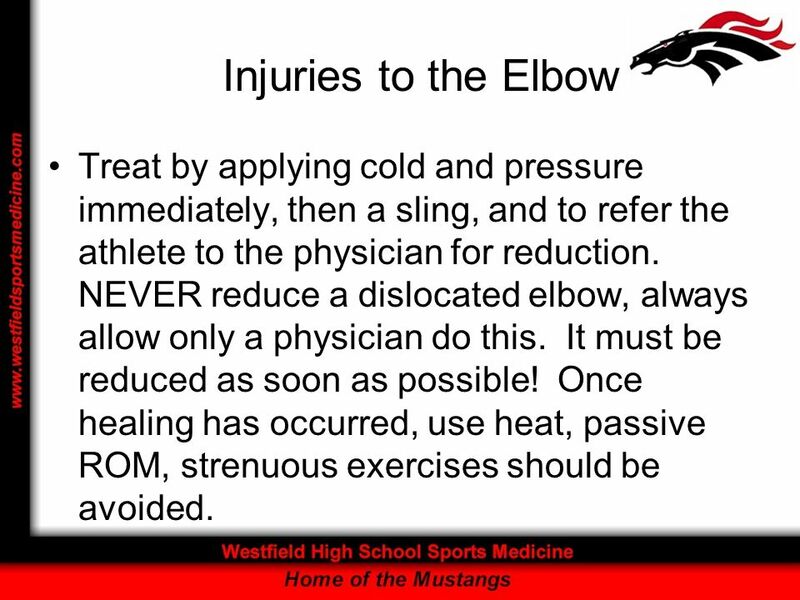 14 Injuries to the Elbow Treat by applying cold and pressure immediately, then a sling, and to refer the athlete to the physician for reduction. 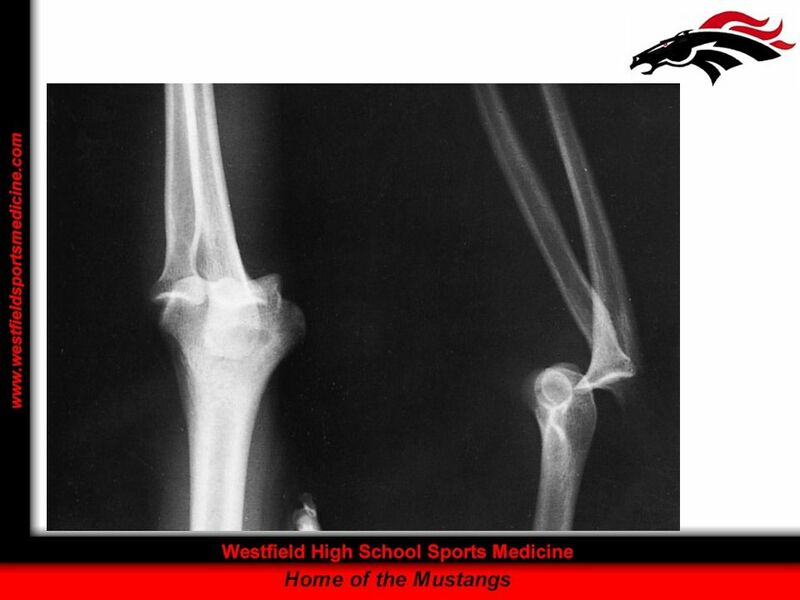 NEVER reduce a dislocated elbow, always allow only a physician do this. It must be reduced as soon as possible! Once healing has occurred, use heat, passive ROM, strenuous exercises should be avoided. 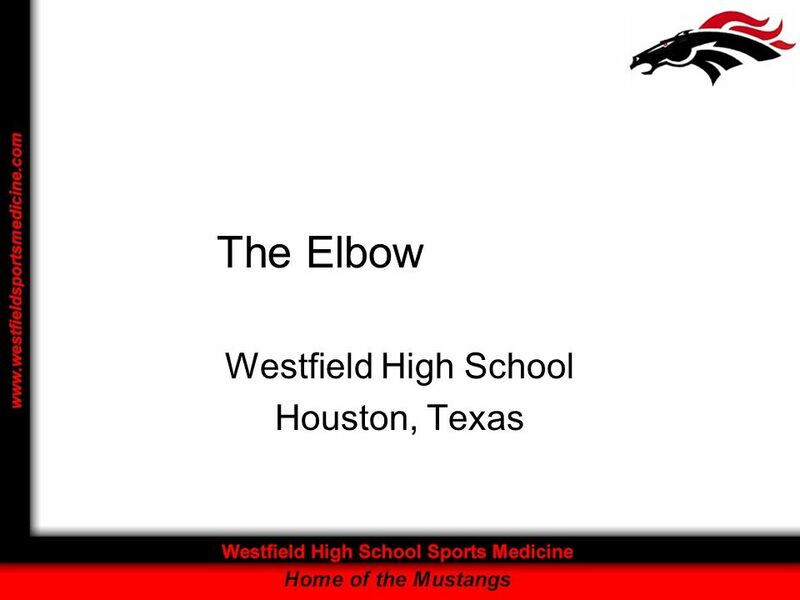 Download ppt "Westfield High School Houston, Texas"
Do Now Draw or trace the bony anatomy of the elbow on page 111 (Figure 11.1). Identify: Humerus Medial epicondyle Lateral epicondyle (not labeled in figure. Wrist and Hand Chapter 18 May 2006. Anatomy Bones Carpal Bones are irregular shaped bones that articulate between the radius and ulna of the arm and the.